Louis J. Kaep, a graduate of Loras College, studied at the Art Institute of Chicago and the Academie Julian in Paris. After moving to New York, he was an art director at Montgomery Ward. Kaep gained special recognition from his work with the United States Navy and the Seabees. He was nicknamed "The Admiral" after a completing a commission from the United States Navy in 1960 to produce a series of paintings while accompanying the Sixth Fleet on maneuvers in the Mediterranean Sea. In 1961 he received a similar commission with the Seabees in the South Pacific and Far East. His paintings were displayed in Washington, D.C. at the Naval Combat Art Collection. His paintings of scenes and people in Europe, South America, the Pacific Islands, North Africa, Hong Kong, Tokyo, Thailand, Singapore, Hawaii, Formosa and the Caribbean countries were exhibited in more than 200 one-man shows here and abroad. He once estimated he had turned out from 400 to 500 paintings which he considered acceptable. 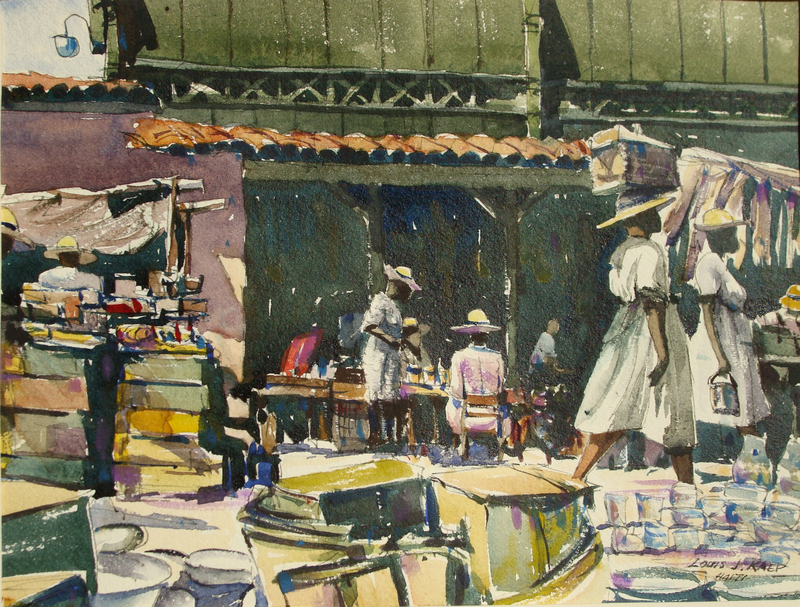 Kaep was the recipient of more than fifty awards including the Gold Medal for Watercolor, Hudson Valley Art Association and Bainbridge Award. For his work, he received the Navy Meritorious Public Service Citation, among the highest honors conferred on a civilian. He was an instructor at the Art Institute, Academy of Fine Arts in Chicago, Illinois; a member of the National Academy of Design and the American Watercolor Society; and among those listed in both Who's Who in American Art and Who's Who in America. In 1963 Kaep was vice president of Vogue Wright, one of the largest commercial art studios in New York city which employed a staff of 125 artists and photographers. He later held the presidency and vice-chairmanship of Electrographic Corporation, a New York-based firm involved with graphic arts including advertising and photography. Kaep, Louis J., “Haiti,” Westport Public Schools Digital Collections, accessed April 24, 2019, https://collections.westportps.org/items/show/1639.